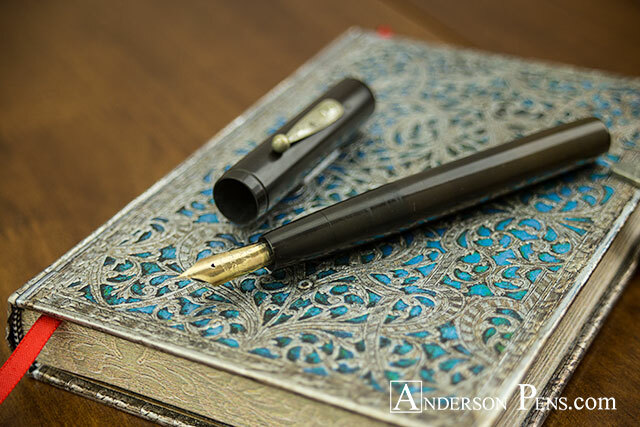 This week on My Favorite Pens, we take a look at one of the harder to find sizes in the Waterman Eyedropper lineup, the Waterman 17. Waterman made this pen ca. 1908 and placed it in between the 16 and the larger 18. Available in cone cap (as shown here), straight cap, and taper cap, this was an odd size in the Waterman lineup, having a nib only slightly larger than a 16, but significantly smaller than that on an 18. 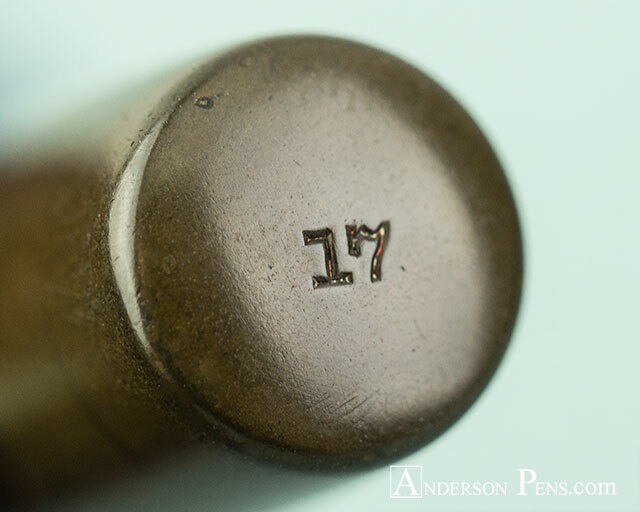 Generally speaking, the Waterman 17 I show here is a fairly boring and well worn pen. Originally a chased hard rubber pen, the chasing is mostly worn down now 100+ years after its creation. 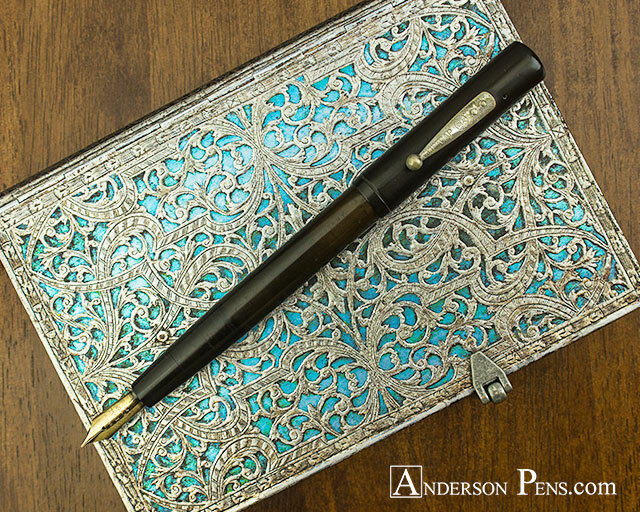 While I enjoy hard rubber pens with some form of gold or gold filled ornamentation, there is beauty in a large mostly unadorned pen, the only real trim being the optional nickel plated Clip-Cap. Perhaps due to its lack of difference between the 16 and 18, the 17 is a very hard to find pen nowadays. Models exist in Black Hard Rubber, Black Chased Hard Rubber, Mottled Hard Rubber, and even overlays, the latter two examples being exceedingly rare. One will find far more 18’s than 17’s in the wild and at pen shows. While this pen may be well worn, perhaps one of the most important parts of the pen isn’t, that being the barrel end imprint. In fact, examining the picture above, we can still see some of the original red chalk marking evident inside the number itself. The nib is, of course, the second part of the important puzzle, and despite needing some TLC (tipping and a crack extending from the base of the nib), is present, readable and accounted for. I was fortunate to acquire this pen for about the cost of the nib, so any money invested in fixing the nib would be well spent. The 17 is a chunky pen with decent length to it. While it does post, I don’t normally do so with my vintage pens, particularly harder to find hard rubber pens where cracking a cap would cause the value of a pen to drop severely. This one is large enough that is sits comfortable in your hand. In fact, posting really makes it an awkward length. The scarcity of this pen, along with the large size and early manufacturer make it one of my favorite pens. 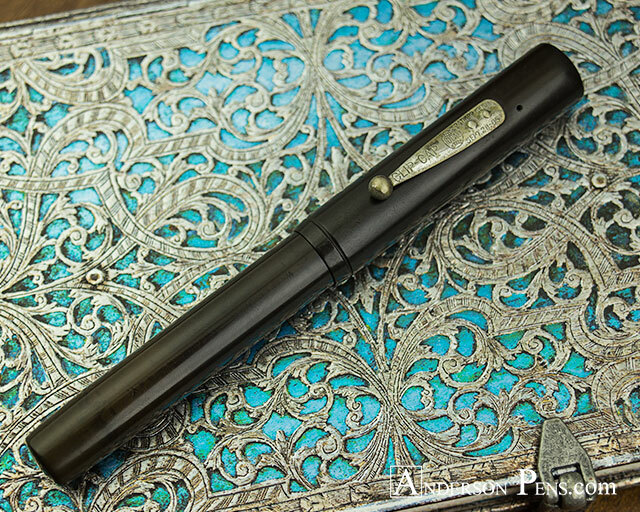 This entry was posted in My Favorite Pens, Vintage Fountain Pens and tagged Waterman. Bookmark the permalink.